Here at the headquarters of the People’s Archive of Rural India (PARI for short), you’ll find a motley crew – writers, editors, translators, photographers, videographers, coders – scattered about on an even more motley assortment of window ledges, stools, and orphaned couch cushions. We take turns crouching next to the low coffee table or perching on nested stacks of plastic chairs, toes dangling just off the floor. Any unoccupied surfaces are strewn with the tools of the trade we ply: notebooks, camera gadgetry, assorted USB cables and adaptors. There are fresh coconuts in varying stages of consumption, their innards plumbed by flimsy orange straws, and banana chips if the snack vendor happens to have visited the night before. We’re a cheerful bunch here at PARI: we giggle over YouTube videos of toddlers getting into scrapes. We watch infomercials about air fryers and, on occasion, buy them. We have spontaneous sing-alongs: Bollywood hits, ghazals, and the Sound of Music are all fair game. Cake on birthdays is a PARI imperative, and we’re incrementally working our way through every item on the Theobroma menu. Lunches are indoor picnics with everyone sprawled out on the floor, freely sampling each other’s offerings. We’re language nerds too, so if you stop by for cake or tea, you’ll be privy to passionate etymological speculations and gentle teasing about our various regional accents. There are heated (though always cordial) debates about politics and history and science and religion. And everyone more or less refrains from making fun of my all-too-American penchant for eating peanut butter straight from the jar with a spoon. Sainath himself appears at intervals, unannounced and without fanfare, to check up on our progress and chat. A few minutes of conversation with him are more energizing than a shot of strong South Indian coffee from his 100-year-old brass filter. I feel painfully, palpably star-struck in his presence; yet for all his professional renown, and the dozens of awards that adorn the office walls (not to mention the dozens more stashed haphazardly in cupboards), the Real Life Sainath is down-to-earth, kind, hilarious, and utterly relatable. It’s hard to stay shy while you and The Boss are wandering around the office flicking bugs off the ceilings with grass brooms. That’s what it means to be part of the PARIvar. There’s no place here for hierarchies or ego. It’s you and one of the foremost journalists of our age dusting cobwebs. Browsing online pizza menus. Talking about cabbage. Team dinner at the Salt Water Cafe in Bandra. 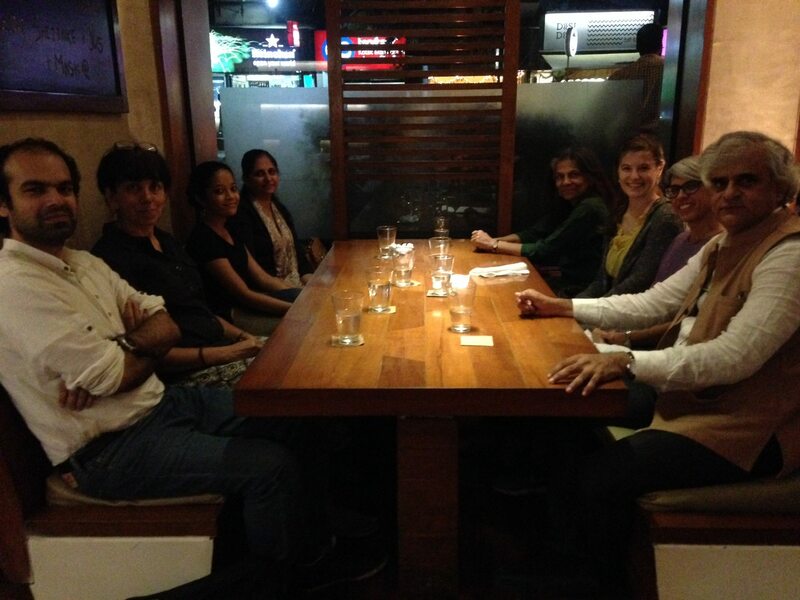 From left: Siddharth A, Sharmila J, Samyukta S, Namita W, Sonya G, Olivia W, Binaifer B, and Sainath. “Parivar,” the Hindi word for “family,” conveniently contains our organization’s acronym: a happy linguistic accident, perhaps. But it’s no accident that we’ve chosen this pithy moniker to describe our scrappy band of journalists. And the family ties don’t end at our doorstep. All of India belongs to the PARIvar. The Archive is a truly collective undertaking: of, for, and by the people to whom it owes its existence. PARI plans to commission a total of 95 fellows every three years to report directly from rural areas. A team of volunteer translators renders content in a dozen regional languages. The ongoing Faces project, which aims to compile at least three photographs – one man, one woman, and one child – from every rural district in India, now boasts over 540 published entries from 121 districts (out of India’s 687), with scores of contributions directly from the public. Moreover, the PARIvar is not bound by India’s borders. I was a member of the PARI Family back in my bright yellow Seattle apartment when I perused the archive for the very first time, laughing in delight over the potato song. (If “the potato song” means nothing to you, abandon my blog entry immediately and read this.) You’re a part of it too as you browse the PARI website. On days when I feel very much The Stranger in a Strange Land – when the kela vendor returns my proffered smile with a suspicious glower and a sad, squashy banana; when I give up trying to stay dry in the monsoon rains and submit to the gutter waters coursing freely over my chappals; when I feel my muscles clench against the pressing crowds and my heart clench against the relentless stares; when, in desperate need of laundry detergent, I walk past seven successive dry goods stalls because I’m too ashamed to expose my feeble Hindi – climbing those five flights of stairs to PARI Command Central reminds me that I am, in some small way, part of the larger Indian community. Maybe not by birth or credential or creed, but by adoption into the PARIvar. My contribution to the family photo album is a small one (I’m that slightly awkward distant cousin who hovers by the dessert table at holiday gatherings), but I am part of a mission that transcends generational and national divides: empowering a people to write their own histories and chart their own futures. That’s a family motto I can get behind. So, welcome to the PARIvar. Have some chai and stay awhile. First encounter with my incredible mentors, Shalini Singh and Siddharth Adelkar. First published on the AIF Clinton Fellowship Blog on October 11, 2016.